We’ve seen individual editor’s picks, we’ve already seen some of the platform toppers in dedicated posts, but today are the big ones. Today we learn which game the BG team voted in as our Game of the Year for 2017. That’s not all though, as the rest of the category leaders will be announced, and we’ll see which platform our squad voted to be the best of the best for the past year. It’s a huge day, so let’s dive right in. All the way back in 2014, gamers saw the first glimpse of this grainy and cartoony adventure staring a man with a cuphead. The unique aesthetic introduced into instant stardom. Every year during the Xbox E3 presser, gamers would wait with bated breath for another glimpse at this spectacular game. Each year, the team at Studio MDHR would release just a little bit more and like a crazy drug addict, gamers would eat it up. Then things went quiet and Cuphead started to become almost a legend. A game so ambitious, it was all hand-drawn animation, may never be released. Then gamers finally saw the light of day in 2017. It is with great pleasure that Brutal Gamer awards the 2017 Xbox Game of the Year Award to the amazing game, Cuphead. It has lived up to the hype and delivered in so many ways. Not only is the aesthetic of the game unique, its approach to gameplay is also unique for the Xbox One. Each mini-world consists of several bosses and a timed race level, instead of the typical side scrolling adventure, players fought bosses over and over. This approach worked wonderfully as it level was in itself an unique adventure. It is a rather difficult game as well, but can be enjoyed with a friend through couch co-op. I could go on for several hundred more words about how great this game is, but I would rather just highly recommend you go out right now and purchase the game. The game is a huge life sim and dungeon crawling RPG for the PS4, where you make friends by day and fight monsters by night, using your own personal demons as weapons and allies. This isn’t new for the series, but the way in which the game draws players in and refuses to let them go is pretty special. The game is positively dripping with style, excelent musoc, art and more. This is really a game that RPG fans cannot afford to miss. Do yourself a favor and play this one. Yes, we went with the easy choice. Here’s the thing though, even with all the other titles on this list, and the assortment of great third-party games to hit this past year, Breath of the Wild was kind of the only choice. Winning with ease in our voting, Breath of the Wild redefined the Legend of Zelda series. That’s not lip-service either, the game seriously upped the ante for Hyrule with a truly gorgeous open-world that you could get lost inquire easily. It also packed in an insane amount of things to do, and some excellent play control. It’s epic, memorable, and all-around fantastic. If you have a Switch (and lots of free time) then The Legend of Zelda: Breath of the Wild is as close to a must play as you can get. Those are the ones you already know, but we’ve got more before we get to the big two. Starting things off, the (dedicated) Handheld or VR game of the year. We added these two categories together, simply because they’re not all that well represented in the gaming universe. Though the reasons for that are as different as night and day. Frankly, handheld gaming has had it’s day. There are still a few notables released throughout the year, but the Vita is all but dead, the 3DS is on the way out, and mobile gaming is hit and miss. That’s probably being generous too. Our Game of the Month for October, Metroid: Samus Returns was a glorious return to for for the classic side-scrolling, exploration heavy series. And what a joy it was, with excellent graphics (the 3DS can still go! ), and great play control. Sure, the new melee moves were a little bit of a ringer-move for Samus, but that didn’t mean that the game was ruined one iota. If this turns out to be the last “big” release for the platform, then so be it. Metroid: Samus Returns was one heck of a way to go out. Still a formidable force in the gaming industry is the PC. The first platform is still a favorite among those who love to build their own machines, and tweak them to the extreme. It’s also the place where you’ll usually find the very best in graphics options, and for first-person shooters it offers the tops in control. Of course, the PC is also the de facto place for real-time strategy titles. It’s rare to see anything in that category on any other platform. In 2017 there weren’t a ton of top flight exclusives for the PC, but there was still some quality gaming to be had. Our staff nominated a few titles, like DC Comics fighting game Injustice 2, and Neir Automita, but in the end the gold went to a familiar name. Not a game without its issues, our pick for PC GotY nonetheless delivers the goods for RTS gamers looking for a new obsession. Excellent graphics and control and some interesting options like the hero characters (even though they weren’t implemented all that well) made for a solid time all around. And as our own Benj said in his review, the story offered is an extremely deep one. So deep in fact, that Benj actually did a ton of reading into the Warhammer 40K universe’s back story just so he could grasp the entirety of it. And that’s not a knock by the way, the game actually pulled him into its universe that much. Any title that can do that, I have to imagine is more than worth a play. And that does it for the remainder of the categories, which means it’s on to the big ones. This next award goes to the title that we held above all others – the Game of the Year. There have been a lot of great titles poured over this week here on BG. We’ve shown you our picks for the platform bests, some of the best in graphics, story, and multiplayer, and even chosen a few of our favorite stories of the last 12 months. This though, is for all the marbles. This is the Game of the Year. A legendary series made the launch of Nintendo’s Switch an incredibly memorable one. Breath of the Wild introduced a whole new Zelda adventure with open-world gameplay, plenty of action and crafting (even cooking! ), and a true sense of adventure. 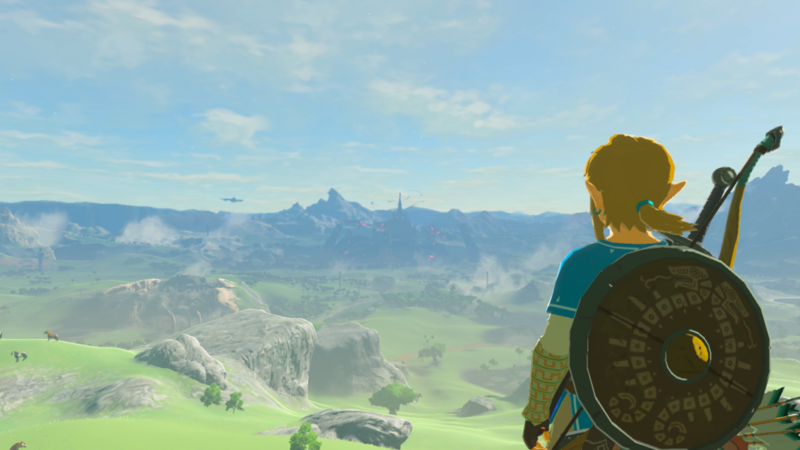 While The Legend of Zelda has always been known as a series that encouraged exploration, Breath of the Wild took that theme to heart and ran with it. Dozens of hours could be spent in this game’s world without even touching the main quest in any major way. As much as I enjoyed Super Mario Odyssey, Breath of the Wild was beyond the right choice for the console’s launch. This is a gem that kept players busy through the summer months and then some. Oh, and did I mention that the graphics are stunning as well? 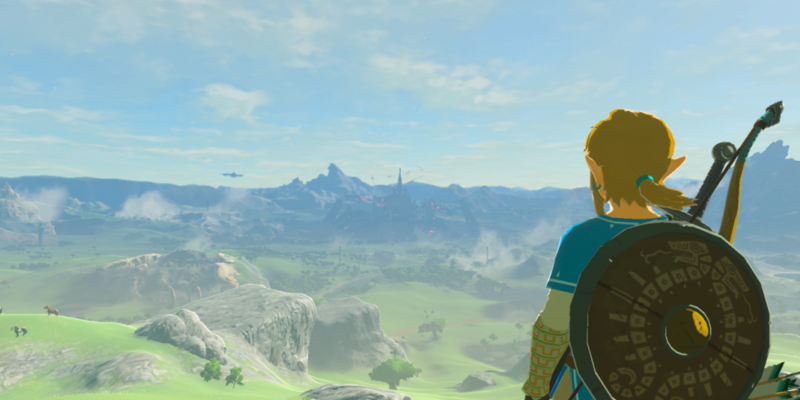 Breath of the Wild is a phenomenal showcase game for the Switch, and a title that no fan of the series or RPGs in general should miss out on. Is this a bigger category than Game of the Year? It could be. This past year being the high-water mark that it was, it’s easy to point to the games as the “thing”. But there’s another factor at work, and that’s the incredible crop of platforms and competition out there right now. Think back to the year that we just had, and it’s easy to see why this is the best group of game-bearing devices in years… maybe ever. Our Game of the Year Breath of the Wild is the tip of 2017’s iceberg. Cuphead, Metroid: Samus Returns, Middle-earth: Shadow of War, Persona 5, Horizon Zero Dawn, and (much) more made is a 12 months to remember. So picking a winning platform is more than a little tricky. Though, choose one, we did. To say that I wasn’t too bullish on Nintendo’s Switch would have been an understatement. A console that users cartridges? An anemic launch lineup? Not even a Virtual Console? Yeah, all of that kind of didn’t matter. At all. The Switch absolutely exploded onto the gaming scene in 2017, selling 4.8 million units, globally. That was a success that was anchored by Breath of the Wild, which held the console’s fans enraptured till more titles could arrive. And arrive they did. By the end of the year, the Switch was home to Mario + Rabbids: Kingdom Battle, Mario Kart 8 Deluxe, Super Mario Odyssey, and more. You want third party? You want “Mature” titles? Skyrim, sports games, and even freaking Doom were all out and playable by the Holidays. And if you think that 2018 won’t hold the same promise, well you just might be wrong. As Wolfenstein: The New Colossus, Bayonetta 1&2, and many more have already been announced. Nintendo, folks, is back. And you can thank the Switch for all of it. And that does it for the 2017 BGAs guys and gals! We hope you enjoyed this week, because we sure did. It’s always fun coming up with award nominees and picking winners from your favorite titles. It just doesn’t get old for us, and we hope you found a few things to agree with. If you didn’t, feel free to let us know all about it in the comments below. We’ll see you right back here again next year for the 2018 BGAs, but don’t forget that all year long, Brutal Gamer has you covered with the latest and biggest news and reviews from the worlds of gaming, comics, and everything in between!